Michael John Trotta is one of the most “exciting and prominent new composers of choral music,” a sought-after conductor, and dynamic clinician. 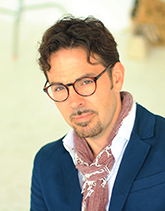 He brings an “intimate knowledge of the human voice,” a “rare sensitivity to the capabilities of a choral ensemble,” and years of experience as an inspiring educator to thousands of singers each year. His award-winning commissions are frequently performed at Carnegie Hall, at national conventions (ACDA, NAfME, AGO, TMEA), and his recordings are broadcast worldwide. Dr. Trotta lives in New York City with his wife Rachel where he works as a full time composer, conductor, and clinician with choirs throughout the country. Trotta recently conducted world premieres of three new major works, Light Shines in the Darkness, For a Breath of Ecstasy, and the Carnegie Hall Premiere of much the anticipated Seven Last Words – (SEPTEM VERBUM ULTIMA). In addition to the release of three new recordings, the coming seasons will feature a new song cycle for Baritone and Soprano commemorating the centennial of Sara Teasdale’s Pulitzer Prize winning Love Songs, a violin concerto for Andej Kurti, and his next major work for choir and orchestra, Magnificat. Dr. Trotta frequently appears as a guest conductor at Carnegie Hall and has made appearances at the Texas Music Educators Association – TMEA Convention, American Choral Directors Association – ACDA National Convention and has had composer residencies and clinics at SCMEA Conference, Loyola University, Northwestern State University, and in 2019 he will conduct the TN All State Choir.